On Thursday, Rite Aid Corp lowered its profit outlook for the full year after reporting earnings for its first quarter that were worse than had been expected, hurt by taxes related to an acquisition that is pending and interest costs. The drugstore operator cut its forecast for profit to between 14 cents and 22 cents a share for its fiscal year 2016 from it prior forecast of between 19 cents and 27 cents per share. This, the company said was to reflect the acquisition announced last February of EnvisionRx, the pharmacy benefits manager. Rite Aid expects its revenue for the full year of between $30.6 billion and $31.1 billion. For the quarter ending May 30, its fiscal first quarter, sales at same stores rose by 2.9%, hurt by its introduction of newly released generic drugs. That result was below the estimated increase of 3.8% by Wall Street analysts. 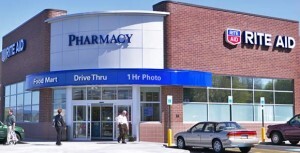 Rite Aid sells personal care products, over the counter medications, and food and beverages. The company said its total revenue was up 2.8% to end the quarter at $6.6 billion. Prescription drug sales represented 69% of the total sales at the drugstore. Rite Aid is the nation’s third largest drugstore by sales behind both Walgreens and CVS Health. Rite Aid has adjusted and expanded its business model due to the industry expanding into the health and wellness segment. Net income was down for the quarter to $18.8 million equal to 2 cents a share from the same quarter last year of $41.3 million equal to 4 cents a share. Analysts were expecting profit to be 3 cents a share and revenue to come it at $6.64 billion. Rite Aid confirmed its full year forecast for its sales at the drugstore of between $26.9 billion and $27.3 billion, with its sales at same-stores projected to increase between 2.5% and 4.5%, said company officials in their Thursday financial posting of earnings.